Hello friends and welcome to part two of the Thanksgiving 2011 Smoking Meat Newsletter. 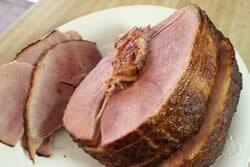 This week we are going to discuss ham.. the other traditional holiday meat. When I say smoking a ham, you might think that I mean curing, smoking, hanging in the barn for weeks on end.. but not so. 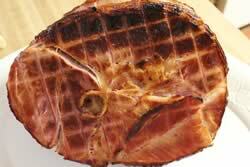 I typically purchase an already cured and cooked ham and after applying some seasoning, smoke it for about 3 hours. You have to taste it to believe the flavor difference between one that is home smoked and one that is not. It's sort of like smoking hotdogs.. you don't think it will make that big of a difference and then WOW! I have been doing these this way for years and the results are always overwhelming. It's not rocket science and is one of the easiest things you'll ever smoke but so many folks have never tried this so I enjoy writing about it and finding ways to make it interesting. This year, I decided to use a little pineapple-mango jelly with my rub recipe as a twist on the traditional pineapples on the ham.. I have to say it really worked and I could smell the awesome pineapple aroma as it came off of the smoker. As promised, I am also going to try to answer many of your holiday cooking questions based on the emails I have been getting from you over the last few weeks and I am anxious to get right into it. I hope all of you have an excellent time with family and friends as you celebrate Thanksgiving this year and as always, if you have further questions even if its on Thanksgiving day.. The best way to get a fast answer is via the forum at SmokingMeatForums.com. For this purpose, I prefer the hams that are spiral sliced, already cured and cooked and on sale. Watch out for the ones that have a high water content.. Saw one the other day that had 22% retained water. Some of them will also say something like “ham product”… I would stay away from those. It is perfectly ok to purchase one that says it's already smoked.. The smoke that you will add at home will outshine the factory process by leaps and bounds.. no comparison. 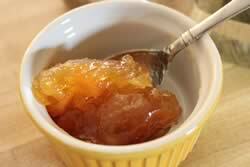 To do this up right you will need a batch of my rub and some pineapple jelly of some sort. I found some locally that was all natural with no sugar in it. It was a pineapple-mango blend and is super delicious. I put about 1/3 cup of the jelly in a microwave safe container and heated it on high for 25 seconds to make it more spreadable. I then mixed a tablespoon of my rub into it. 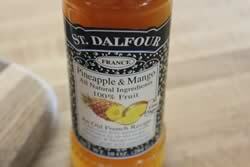 This mixture was spread all over the ham leaving little pieces of pineapple here and there. 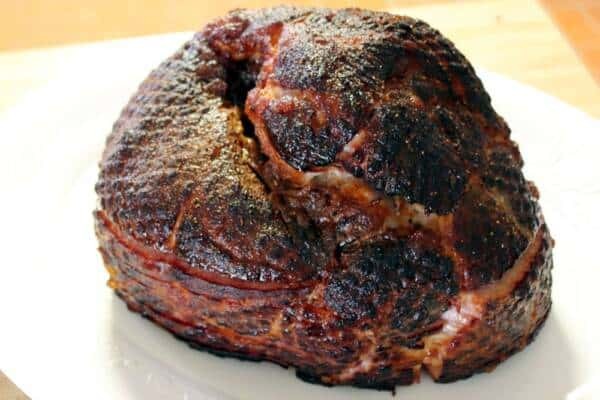 I then sprinkled another layer of my rub onto the ham, using the jelly as a sticking agent as well as a nice layer of flavor. While the rub sort of soaks in a little, go out and get the smoker ready. 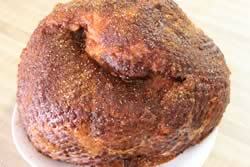 Get your smoker going so that it will maintain about 225 – 240 degrees. 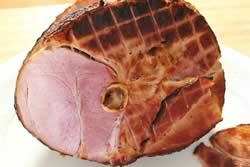 Once the temperature is holding steady, place the ham directly on the grate with the large flat side down. I recommend using a wood that has a robust flavor such as mesquite, hickory, pecan or perhaps oak since we are trying to get some good smoke flavor in a relatively short period of time. 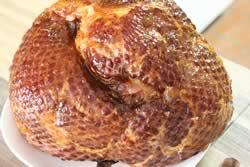 Let the ham smoke for about 3 hours or until it reaches a good eating temperature. I usually just go 3 hours and call it good. Notes: this is for a cured and cooked ham. See my blurb in the “Special Feature” below for how to smoke a cured uncooked ham. I have always put the turkey breast down for about an hour then moved it to the up position for the rest of the time. There is a school of thought nowadays that says breast side down allows the juices to run down into the breast and thereby creates juicier breast meat. While that may be the case and it certainly has some merit, I would only put the turkey breast side down if it has been brined and if there is a barrier such as a water pan or baffle below the grate to keep radiant heat from hitting the bottom of the turkey. In the buttermilk brined turkey in my last newsletter, we stuff flavored butter under the skin in and around the breast so I recommend that you keep it breast side up from start to finish. How Big of a Bird Should I Smoke? I recommend smoking turkeys that are in the 12 lb range or smaller to make sure it does not stay in the danger zone (40 – 140 degrees F) for long periods of time. In larger turkeys this becomes an unsafe practice and while you may have been doing this for years with no one getting sick, I do not recommend it. It is better to smoke two smaller birds than one large bird if you need more turkey. For example: If you need a 24 lb turkey then simply smoke (2) 12 lb birds and there you are. If you already have a bird that is larger than what is recommended then (in the interest of safety) I recommend that you smoke it for 3-4 hours at regular smoking temperatures (225-240 degrees F) then raise the temperature to about 275 for the remainder. If your smoker is unable to do that, it might be wise to finish in the oven covered with foil or in a covered roaster pan. I had lots of emails from subscribers asking me about the flavored butter that I showed you how to make.. I basically had you make a pound of the stuff then only asked you to use 1/3 of it.. well, I forgot to mention that it's great on toast, wonderful on steaks, then there's corn on the cob, and the list goes on and on. If you really don't need that much you can cut the recipe in half, use what you need for the turkey and you'll have a much smaller amount leftover. I tend to write the newsletters based on how I like to do things and I like to make extra of that butter stuff! Some of the turkeys at the store will have a solution of salt, water, etc. already injected into the meat and I have folks asking me if they can brine those.. well of course you can. As I've said before, I'm not a scientist and I don't claim to have a thorough understanding of how brining works exactly but I do understand the basics and I can tell you that the results are astounding. For some reason, even if the turkey is already brined/injected, it does not matter. The brine that you make will somehow tend to replace what is in the turkey already. And the way you will know this is because if you put any flavoring into the brine such as Zatarains crab boil, Tabasco, apple juice, beer, etc. you will be able to taste it in the finished turkey and it will not be overly salty. I do recommend using a fresh, minimally processed turkey if you can find one but if you can't don't despair. Use what you have and it will work just fine. Sometimes on holidays, you need to be able to smoke the turkey at home then travel 2 hours to grandma's house so you find yourself in this quandary on how to make that happen so that it's still warm once you get there. Smoke cook the turkey completely until it is done and ready to serve then immediately wrap in foil, then wrap it in a couple of the thickest towels you can find. This alone will insulate the bird really well and keep it hot for a good while. Place the wrapped bird in an empty ice chest and if you have room left over in the top and/or sides, fill the empty space with throw pillows, small blankets or even more towels. Close the lid tightly and keep it closed.. no peeking. This configuration will keep a hot turkey, ham, brisket, whatever you have, hot for as much as 3-4 hours. If you are worried about it, you can always leave the probe end of a digital probe meat thermometer in the turkey and wrap the foil and towels around it. close the lid of the ice chest with the thermometer wire sticking out and plugged into it's monitor. This way, you can monitor the internal temperature of the bird. If it's going to be longer than about 3-4 hours then I recommend you smoke cook the turkey ahead of time then refrigerate until you get to grandma's house then follow normal reheating procedures. Note: if you are making the turkey more than 3 days in advance, then you will need to freeze it for a couple days then thaw it out when you are ready to use it since it is not recommended that you keep turkey in the fridge for more than 3 days once it has been cooked. This can be a problem since every time you reheat turkey, it's going to dry out a little no matter what. There are methods that tend to do a better job than others. 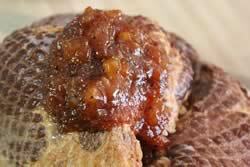 For instance, the best way to reheat meat is to vacuum pack it when it's done cooking with a little of it's own juices. Reheat the vacuum packs in boiling water for about 10-15 minutes or until it's as warm as you like it. Another great method is to use the crock pot or slow cooker.. put a little chicken broth or just water in the bottom then layer the pieces of turkey into the pot making sure not to pack too tightly so the steam can get in and around the meat. This is best done on high and may take up to an hour or more but if you will keep the lid down, there will be almost zero moisture loss. To reheat the entire bird, place it in a roasting pan with a lid or in a pan with foil placed tightly over the top to keep all the moisture in. 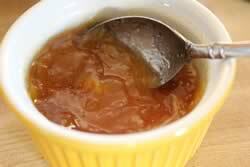 Place a little stock, water or apple juice in the bottom of the pan just before covering it up. Reheat at 275-300 degrees for 3-4 hours or until the internal temperature of the bird reaches a good eating temperature. For me that's about 140 degrees or so. The lower the better since as it gets hotter, it will start to dry out more. Your best option is to take the meat off the bone when it first gets done smoking then transfer it to ziploc bags or vacuum bags before refrigerating. This makes reheating a lot easier and you don't have the bones and carcass to deal with. The best tip I can give you on this is to have some gravy made up.. if the turkey seems to be dry when it gets done reheating, just pour some good thin gravy over the top (before serving) and that will juice things up a little bit. In most cases, you'll be the only one that even knows it was a little dry. if you are in a hurry and just cannot do a brine on the turkey then by all means, inject the bird in order to get a little flavor down in the meat. Having said that, there is no substitute for brining.. injecting and brining both add flavor but brining will give you a moist bird that no amount of injecting can duplicate. Just stick the injector in at a 45 degree angle, back the injector out slowly as you depress the plunger. Once the fluid is squirting out of the hole, move to another spot. As with most things, the best teacher is experience. Most of you know by now that I am NOT a purist by any stretch of the imagination. I am all about doing what tastes good and having a sort of “no-rules” mentality when it comes to cooking. This of course is assuming that you are following what is considered to be safe practices. Many folks have emailed me and asked me if it would be bad to smoke the turkey for a little while in the smoker to give it some flavor then finish it in the oven.. well, no. I wouldn't call that bad at all if that's what you want to do. Anyone who would call that bad.. well, we'd just have to have some words over that. There is absolutely nothing wrong with smoking the turkey for 3-4 hours to get some good smoke flavor then finishing in the oven if that's what you need to do. Once you bring the turkey in the house, place it in a pan, pour a little broth, juice or just water in the bottom of the pan and cover the turkey with a lid or foil making sure it is tightly closed so that no moisture can escape. This does not change the brining process.. I have a theory about brining in that I believe it reaches a point to where the liquid is drawn into the meat and then it stops as if it’s somehow neutralized. I don’t know at what point this happens.. maybe at 4 hours and perhaps at 10 hours but until I’ve tested this theory enough to know for sure, I recommend brining a turkey cut up into pieces overnight just as you would if it were whole. If overnight works for a whole turkey, then it also works that way even if it’s cut up. I prefer kosher salt for seasoning and brining.. it’s just what I’ve always used and I like the speed at which it dissolves and it seems to work very well for me. I like the non-uniform, course granules and the flakiness helps it to stick to the meat really well when I use it in rubs and seasonings. Pickling salt works equally well, some might say it works better but I would argue with them;-) The granules are more uniform and are smaller in size than in kosher salt. What Cuts can I use Your Rub On? My rub was initially intended, designed and created for pork ribs.. all of the testing was done on pork ribs. Once the rub was finished after hundreds of iterations, it was discovered that the rub was also very good on other cuts of pork as well as on beef, poultry, fish, seafood and even the Thanksgiving turkey and ham. I have folks constantly sending in emails letting me know some new food or recipe that they have used the rub in. I get quite a bit of this with the sauce as well but the rub seems to be the main star of the show. Smoke a Turkey Breast instead of whole Turkey? Same procedure applies.. brine overnight, apply the rub making sure to get it up under the skin as much as possible. A normal 5 to 6 pound bone-in turkey breast will take about 4-5 hours to reach an internal temperature of 165 degrees in the thickest part of the breast. I do not recommend this type of configuration when slow smoking meat and especially poultry since the layering makes it very difficult for the low heat to get to the center in ample time to prevent spoilage. The only option would be to cook it much hotter than you normally would (275+) while applying smoke. What about Stuffing/Dressing in the Turkey? When smoking chickens, turkeys and poultry in general, do not stuff it. This prevents the low heat from getting to the inside of the bird and is a safety risk. It is much safer and recommended to make the stuffing or dressing in the house then stuff it in the cavity of the bird right before serving. The buttermilk adds some richness and has a tenderizing effect on the meat. It still works the same way as a normal water brine in getting the flavorings and the moisture into the meat but the added tenderness and the rich flavor really gives it that wow factor that I’m always looking for. What About a Cured but Uncooked Ham? These are a not as common as the already cooked ones but if you do find one, make sure to cook it to155 degrees before serving. You should be able to figure on about 30-40 minutes per pound depending on your smoker temperature and other variables. For best results, let it rest wrapped or tented with foil in a 140 degree oven for about an hour before serving. Use some mustard as a sticking agent then put my rub all over it to season it up. Let the good times roll! Can I Brine a Frozen Bird? No.. the turkey must be completely thawed before brining. The brining process will not work on a bird that is frozen.